These little controllers are also good in that they feature isolation and simple power supply arrangements. Earth loop problems on PC's driving USB motion controllers driving motor drives with limits and encoders can be very frustrating. While we are currently discussing beginners' questions, may I ask a couple of my own? 1. what is the difference (to a potential future user) between the 1.1, 1.14 and 2.1 versions of these controllers - given that all 3 versions appear to be in the market at the same time now? 2. what is the difference between these and the similarly priced CW40 controller? It appears from the descriptions that it has similar functions, a lot more manual editing functions and buttons and a seemingly higher resolution screen (alas a smidgen smaller). A little recap of my understanding for comment and education, please? watch for any glitches/abnormal behaviour etc. Yes, I do know there has to be a suitable machine tool, with stepper or servo motors and their respective drivers and power supply/ies and a controllable spindle (VFD/DC/Servo) - all connected to the above controllers. I'm starting to seriously thinking about starting with a small 3-axis router/mill to get my feet wet.... I make tools and bits for vintage motorcycles as a hobby in my retirement (I'm 67).... Have been using computers since the early 80s, but never had a connection to CNC at all. I think the cw40 doesn't execute gcode directly, but I don't really know the answer. Make a dxf of what I wanted, making sure I knew where 0,0 was. Fyi, the aitocad fonts DON'T engrave. I used a freeware that would make vector letters. Run "dxf to gcode" to convert. It hasnsettinhs for the basic cnc stuff, like feeds and speeds, and how deep to cut per pass. Put the usb stick in the DDCSV. Put the cnc in the right home position and zero. I've also handwritten gcode for other weird automation tasks with this controller. I assume that aitocad should be Autocad? I use Autocad 2008 and can produce outlines from any font for engraving. I have a menu item Express/Text/Explode Text. This gives you an outline of the font. 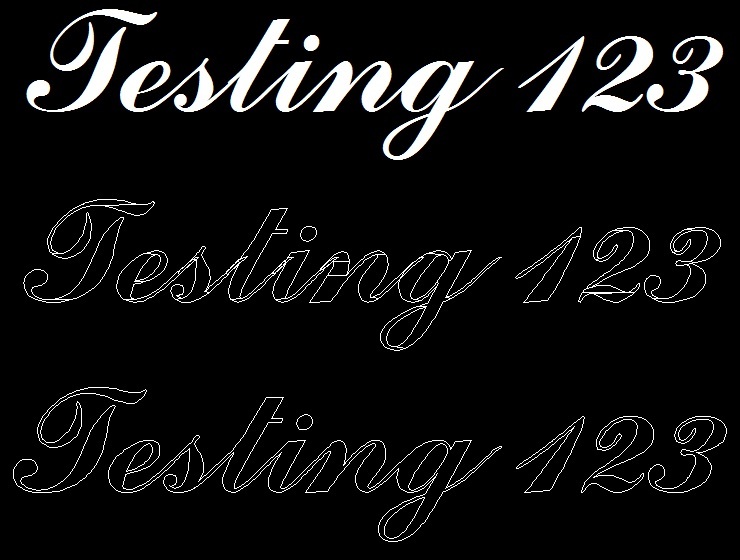 In this example I used a complex script font which needs a bit of tweaking afterwards. Simpler fonts come out OK with no tweaking necessary. i know there is the new firmware that is made ..haven't tried it .. but was wondering if it can be programed to run grbl ? estlcam have a few good things going for it as you can prob the whole workpiece incase your higher or lower in some spots.. can it be done? Well in fact we were once planning to write entirely new firmware, but time is just too limited. If we had done so, I would have most likely ported a good part of grbl over. I have got a working C compiler toolchain for this controller, however reverse engineering of the FPGA got stuck at some point. 1. Honestly, I don't know. The new versions of the software are compatible across all versions though. Personally, I only own the DDCSV1.1, so I can't tell what they have changed. It's probably only some minor things in the hardware / FPGA. 2. The CW40 is a completely different product and is not compatible with our modified firmware. It's a completely different can of worms. It does not have an FPGA which decreases the accuracy and smoothness. Also, I doubt there is any room for community based software improvement on this model. Thanks for those answers and explanations! It's simply the way the step generation works. An FPGA can do many parallel tasks at the same time and take load off the CPU. There is also way more accurate timing since the CPU is not shared between G-Code decoding, screen updating, user interface tasks, USB stack, operating system and then the real time step generation. In the DDCSV1.1 the CPU sends blocks of motion data directly to the FPGA that handles the entire step generation process smoothly and in parallel. Also, I would not really trust any specs on Aliexpress or other Chinese sites. They are often multiplied by a factor between 2 and 10. Not all vendors do that, but many definitively do. Apart from that, there is jitter and other bad effects from CPU based step generation, that are (almost) not present when dealing with an FPGA driven system. Chinese software is never up to scratch. They make very good hardware, but the software very often is just really poor. I am sure this may improve over time, but we are not there yet at all. Again, this does not apply to everything, but to a rather large amount of products. Not just Chinese companies Benedikt - VW I have tested the CW40 and the specification is correct as given by AliExpress seller CNC Workshop. What is the latest factory software revision - on your web site you have v87 - my DC has version 88NOR which is a few days later release than 87. I was going to update to the Pandora version but not sure if it has any advantages. For a full list of changes, head back a few pages ( here: https://madmodder.net/index.php/topic,11598.msg147430.html#msg147430 ). But in a nutshell, it's bug fixes, translation fixes and support of USB keyboards/keypads. And for the future, a plugin system is planned together with the original engineers, as well as support for more languages and different homing modes. Also, there is work in progress for updating the Linux kernel to add support for Ethernet to allow remote control of the CNC / remote g-code upload. If you are looking for the latest version, head back a few posts for a release from December, 26th. Should this version prove stable, it will be added to the Pandora installer and it will be patched with our other improvements. I'm working on writing a guide to the ddcsv Gcode dialect. So far I've proved that it can do HELICAL interpolation using G2 and G3, but only in R mode. Does anyone have working Gcode that uses this form: G2 X10 Y0 I0 J0? I can't get the IJK (arc center) format to work. I already know that a plane definition (like G17) is required. It works!!! And, irritatingly enough, MY program WORKS now, after yours ran?!?! I've got a LOT of questions about this code! What are you using G54(coordinate system) for? FYI, that might be the magic sauce; my controller has never gotten this command before. Your feeds are weirdly small. I found that anything under 300 mm/minute was the same speed. As far as I can tell, G94 isn't in the DDCSV language at all. I tried my program with your first line it it, pulling out commands one at a time, and the dratted thing kept running. Anyway, problem solved (but not understood). With the official firmware since November 2017. Unchecked G40, G41, G42, G49, G20 but most likely already work too. Yes feeds are very small when I am debugging/learning, even when cutting air. M28 is used to write to SD card in RepRap firmware, but you would also need M29. Is it return to origin? Nothing happened when I tried it at 50,50,50. G42 is cutter compensation right. The syntax may be G41 D3, where D3 is tool offset slot 3. It looks like they planned for length offsets too, which would imply G43, G44, and G49 work??? Cutter compensation is in the machine parameters, H0-H15 and D0-D15. This file is 100% processed on my machine with the DDCSV1.1 - 4 axis controller. Firmware from November 2017. Has anyone measured the spindle control output? When I put a scope on it, it looks like a slowly changing DC signal that varies from 0 to 10 Volts; I don't see any hint of PWM on it at all. You need to adjust the max duty cycle with the pot on the board. IMPORTANT: don't try to run it off 5 VDC. It has a 5 Volt low drop out regulator on the board, so it's output current is terrible with 5 Volt power in. "I have just traced out the wiring of the keypad matrix of the controller:"
Does this somehow tie into the previously mentioned USB keypad/keyboard support? I was just wondering if a standard numeric USB keypad could be mapped to the DDCSV1.1 button layout? They both have 17 keys. Hello all DDCSV user. Im all new to cnc machines and its software, but I like to build and make things so now its time for a cnc. I have ordered a few things for several months from China to lower the costs, collected aluminum profiles from the job scrap box and so on.thought it would be a machine that can do wood and metal, I´m working in a paper printing factory so manufacturing of klichés in brass are things that I though may be done. Looks like a nice built unit.